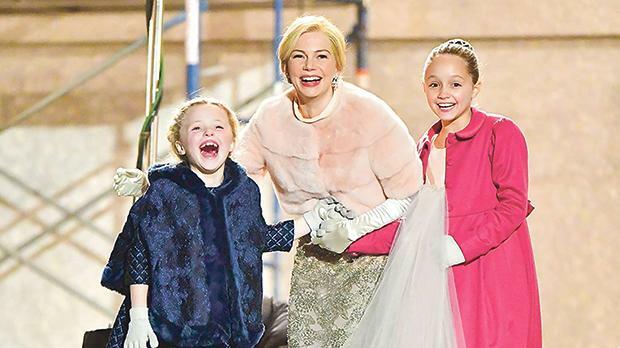 Michelle Williams (centre) with Cameron Seely and Austyn Johnson in The Greatest Showman. By all accounts, Phineas Taylor (P.T.) Barnum, who died aged 80 in 1891, was an enterprising, driven and certainly complex man. Born into a poor family, he lifted himself by the bootstraps to become a showman and businessman. He even dabbled in writing, publishing and politics. However, Barnum is, of course, best known for his showmanship - his name to this day associated with circuses, with the Ringling Bros and Barnum & Bailey Circus closing down only this year - and for introducing the concept of mass entertainment. The Greatest Showman is an all-singing, all-dancing celebration of his achievements, as he struggles to get his first act off the ground and overcomes personal and professional obstacles to secure his legacy. The film is driven by a top-calibre performance by Hugh Jackman in the titular role, effortlessly displaying why he is a ‘triple threat performer’, the role offering him the chance to show off his exceptional singing, dancing and acting skills. His immense range is obvious as he transforms the angst, rage and darkness he brings to bear in Wolverine - one of his signature roles - into the brio, thrill and ambition of Barnum’s undoubtedly extraordinary life in the world of show business – a term the film implies the impresario himself coined. Jackson leads a solid ensemble, including Zac Efron, effortlessly going back to his High School Musical roots as the upper-class theatre producer who is persuaded to ‘join the circus’ and become Barnum’s business partner. Also included are Michelle Williams as Barnum’s tender, loving but tough wife and Rebecca Ferguson as Jenny Lind, the Swedish singing sensation who Barnum brings to America for a sell-out tour. From its opening number to the closing credits, the film features a number of extremely tuneful, emotional, toe-tapping original songs by the Oscar-winning team of Benj Pasek and Justin Paul (hot off their success last year with La Land), brought to the screen in a series of show-stopping numbers full of colour, excitement and vibrancy, heightened by the superb photography, editing and production and costume design from director Michael Gracey’s team. While I would hardly expect a movie musical that celebrates the apparent founder of show business to dwell too much on the shallowness and fakery of said business, I hoped for more depth in the characterisation of its protagonists. One of Barnum’s greatest successes in the early stages of his career were the so-called Oddities, an ensemble of performers with unusual physical traits who Barnum hired as circus acts. It may sound – well, it certainly was – exploitative, and he was aware of it. “They’re already staring at you. Why not get paid for it,” he tells a potential recruit. In doing this, however, he brought these ‘freaks’ out of the shadow and gave them the chance to live a normal life; and by showcasing their talent he offered them the chance to invite admiration and feel pride in what they did. And while the Oddities – led by an amazing Keala Settle as the Bearded Woman with conjoined twins (Yusaku Komori and Danial Son) and ‘General Tom Thumb’ (Sam Humphrey) among the ranks – do get to shine very brightly in the musical numbers, their story of empowerment is only truly illustrated in the rousing number This is Me. A scene where Barnum gallingly does not allow his performers to attend a party after the opening concert given by Lind is very clumsily handled. Also, while the script by Jenny Bicks and Bill Condon returns constantly to Barnum’s craving for acceptance into the ‘higher’ classes as witnessed by the fraught relationship with his in-laws, this is largely left unexplored... as is the often fragile bond between him and his wife often tested by his obsession with his business and the hint of an affair between him and Lind. That said, one cannot deny The Greatest Showman its merits, proving to be a perfect show for the season... a three-star film with a five-star performance from its ringmaster.